Once your Trade Show & Exhibit Graphics have been printed they will most likely need some type of finishing. Your PSP (Print Service Provider) can recommend various finishing options, the most common being mounting and laminating. The most common substrate used for mounting prints is a foam-board like Gatorfoam, Ultraboard or Foamcore. These come in black and white and different thicknesses. 4’x8’ size is the standard board size but larger sizes can be specially ordered. Another very popular material is PVC, such as Komatex or Sintra. Again these come in different sizes and thicknesses and colors. It is more durable than foamboards but also heavier. Clear plexi-glass can be used for second surface mounting for backlit transparencies or for mounting a print underneath the surface. These are typically used on lobby walls with metal stand-offs. As for laminates, a luster laminate with a UV inhibitor is the most common type of over-lam offering some protection to the print. 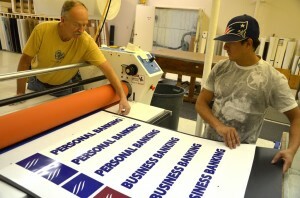 It is mainly used when the print will be mounted on top of a substrate. Laminates also come in matte and glossy as well as textures and different thicknesses.Laminates will help protect the graphic to some extent and the UV inhibitors built into the film will retard fading. Thicker lamination is required like; Lustex, available in 5, 10 and 15ml thicknesses for roll-able panels. Roll-able trade show graphic panels typically will have magnetic tape or Velcro applied to the edges. Hangers and kickers can also be added for use on portable Pop-Up exhibits enabling the exhibitor to hang the graphics onto the hardware. Finishing for fabric banners involves stitching pole pockets to allow a pipe or rod to be installed for hanging. Hemming can be added for a finished look or to help reinforce the edges of the fabric. Fabric can also have Velcro attached to it or silicone edging (S.E.G.) for extrusion based display systems. Other finishing services can include Silhouette cutting to create life-size cut outs and other interesting shapes other than squares or rectangles. Some substrates can also be heat bent to obtain different shapes.